The issue is likely to be raised in the autumn. The Ukrainian parliament has refused to consider reformatting the Central Electoral Commission, according to an LB.ua correspondent. 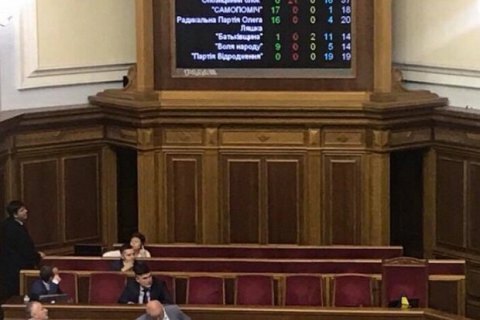 Speaker Andriy Parubiy put it for the rating vote, which showed that the support of 189 MPs was not enough to have it passed. "We can see that we do not have votes to consider the issue of forming a new Central Electoral Commission… Thus we cannot enter the process of considering this important issue," he said. "The resignation of the existing commission and reformatting of a new one may result in a collapse of preparations for an election," he said. According to the deputy head of the parliamentary judicial committee, Leonid Yemets, it was a predictable development. He suggested the issue could be revisited in the autumn. The president nominated candidates for new members of the Central Electoral Commission on 5 February. They had been subjected to special vetting until April. Only two out of 15 members of the Central Electoral Commission hold valid mandates, others' have expired.